There is no shortage to all of the fun and creative ways these pretzel crisps can be used! These Veggie Medley Bites look delicious! There are lots of other recipes and ideas on their website, as well. Definitely, check them out if you have a moment. Chop and shred bell peppers, carrots, and cabbage. 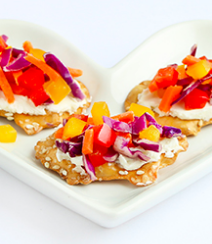 Spread cream cheese on Sesame Pretzel Crisps® and add the veggies on top and press into cream cheese.